Compact flange (RCF), based on NORSOK L005 standard, is applicable to bad sealing environmental conditions of thermal expansion or high fluid loop load strength, such as stand pipe, single-point mooring system, manifold, production tree, submarine pipelines, heat exchanger, as well as other various process industries' piping system. China Compact Flange Manufacturer Yaang offers NORSOK L005 ASTM B564 UNS N06625 Compact Flange. Design principle of compact flange (RCF) is the separate dual seal system of the flange sealing surface. 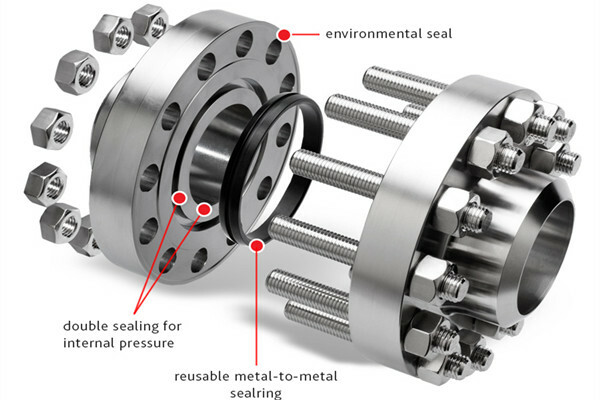 The bottom of wedge-shaped flange face forms the first seal for the pressure brought about by the bolt preloading force; the primary seal is from IX sealing ring and the sealing force is mainly from the elastic energy of the sealing ring itself under the strained condition. 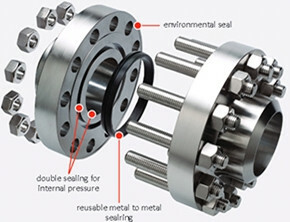 If there is seal leakage at the bottom of the wedge-shaped flange edge, then the internal pressure expands to the outer diameter direction that will also enhance the sealing. A wider temperature and pressure range in design. For larger size and higher pressure rating, please consult the factory. For other materials, please consult the factory. For RCF IX gasket, the axial force applied to the conical surface of the metal seal ring is converted to the radial sealing force. As the bolt's preloading force loads until the entire flange outer edge is sticked tightly, wedge-shaped flange's sealing surface and sealing ring's conical surface and the groove conical surface are closely fitted, and most bolt preloading force is converted into the pressure at the bottom of the wedge-shaped flange's sealing surface. We may provide the design and computing services, calculated by the methods on the basis of Chapter 1, 2, 3 of Vol.8 of ASME. We also provide the analysis and design validation service of ANSYS certified engineers. Where can we find the high quality NORSOK L005 ASTM B564 UNS N06625 Compact Flange.